Santorini is one of the most magical places I visited. The views are absolutely breathtaking, and unlike anything I’d ever seen before. WHEN SHOULD YOU GO TO SANTORINI? We spent four days on the island, mid April. This is the very beginning of the season. From my experience, I would say this is the perfect time to visit. The weather was absolutely beautiful, but not too hot (although still hot enough to get some bad sunburns… bring sunscreen!) The island was really quiet, and it was easy to get a table in the best restaurants without booking days in advance. Because it is “low season”, the prices are also lower (hotel, tours, car rentals, etc). From what I heard, you would have a similar experience visiting in September. **This being said, I wasn’t so proud about a week ago when checking the weather forecast every hour on my phone, which was indicating four days of rain! It is a bit of a gamble. HOW LONG SHOULD YOU SPEND IN SANTORINI? We stayed for 4 nights, 3 fulls days, and I would say that was the perfect length of time. There is quite a lot to see and do, so if you want to have time to just sunbathe and relax, maybe add an extra day. The island of Santorini is BIG! I was expecting it to be all in one place. There are actually several villages on the island, which are all quite far from each other (by that I mean that you would not be able to walk everywhere) so pick your location well! The two main villages, and most “touristy” ones (for the right reasons!) are Fira and Oia (pronounced Ea). This is where most hotels are located. Oia is slightly more upmarket than Fira, but Fira is in the middle of the island, which makes it easier to get around. 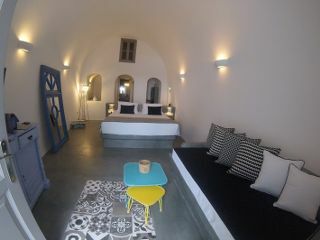 We stayed at Modernity Suites in Fira. Trust me when I say that I spent hours and hours researching “the best” hotel in Santorini, before booking a room at Modernity Suites, and it did not disappoint! I wanted a room with either pool or Jacuzzi (although it you are going in April, forget about the pool, it will be way too cold! ), and “caldera view” (view on the bay). This hotel was absolutely perfect: it’s very well located (at the highest point in Fira, so no one is looking over your balcony! ), meters away from all the restaurants, shops and bus station. There are only 4 rooms (so make sure to book early!) 2 junior and 2 superior suites. 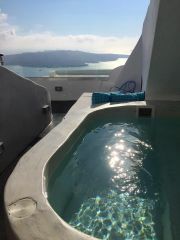 Each suite has its own terrace with caldera view (where breakfast is brought to you every morning) and a Jacuzzi. We stayed in the superior suite which was gorgeous and very spacious. Watch a video of our room here. **I feel like Santorini is on of these places where your accommodation is a big part of the experience. 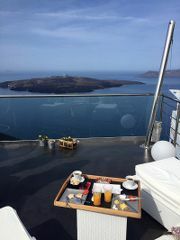 It is worth spending a few more pennies on a hotel with Caldera view, or you will end up overpaying your coffees, drinks and mediocre meals in restaurants strategically located, just so you can see the view! HOW TO GET FROM SANTORINI AIRPORT TO YOUR HOTEL? Santorini airport is only about 5km from Fira, yet, all taxis and shuttle services charge from 40/50€ per person, one way! I had almost given up searching for a “good deal”, reading about airport transfers on forums, when I found Hoppa.com. I had never used Hoppa before, but I definetly will again! You simply prebook/prepay for your transfer online. It only cost us £20 return ticket for 2 people. Someone was waiting for us with a sign at the airport. We only shared the smart looking shuttle-bus with 2 other couples, and arrived in Fira about 15 minutes later. Pleasant surprise: Hoppa had even called our hotel, so when we got off the bus, our host was waiting for us and helped us with our suitcase to the hotel. On the way back, someone came to pick us up from our hotel to walk us to the shuttle bus and drive us to the airport. Santorini is expensive, on Greek standards. It is very touristy, which means you can expect to pay €6 euros for an espresso coffee. However, there are a few cute taverns, where you can enjoy lots of Greek specialties for decent prices… I will share my favourite addresses with you, just keep reading! **Make sure to have enough cash (euros) on you, as most places don't take cards! (or say they don't...) There are a few ATMs in the center of Fira and Oia, but it may be more difficult to get cash out if you leave these two villages. HOW TO GET AROUND IN SANTORINI: RENT A QUAD BIKE! There are many car, scooters, and quad bikes rental agencies. You don’t need to pre-book anything, and can rent it for the day. Just make sure to have your driving license with you. There are regular (and very punctual!) buses. We got a bus from Fira to Oia and back, which took about 40 minutes. There are buses running every 40 minutes (tickets are €1.80 pp). However, if you want to watch the sunset in Oia, you may need to get a cab back to Fira, as the last bus from Oia to Fira leaves at 7.40pm. We rented a quad bike on our last day from Moto Lignos (Fira), which was arranged by our hotel. Someone from the rental agency came to pick us up from our hotel, and drove us to their shop. It only cost €20 + petrol (for 24h), and was a very fun way to get around! Be careful however if you want to drive to Oia, there are two roads. You want to go the longest way, as the other road is dangerous (falling rocks). **You need a valid driving license. We landed in Santorini in the afternoon, and went for a quick lunch at Lucky's Souvlakis, to kick start the trip with a Greek speciality! The plan was to just relax on our balcony and enjoy the sunset on our first night, saving sight seeing for our first full day. After a lovely Greek breakfast taking in the caldera view, we tried to walk it off exploring Fira. There is a beautiful walk to do along the top of the village, towards Firostefani. Make sure to set off early to avoid the crowds.. and the heat! ** If you are feeling brave, you could walk all the way from Fira to Oia. Although it's a 11km walk, which would take around 3 hours. We contemplated the idea but it was already way too hot at 10am for such a long walk in the sun. I hear the views are worth it ... but definitely bring water and a hat! We then made our way to Oia by bus. Spoiler alert: you will step out of the bus and instantly walk into a postcard. Get lost in the white narrow streets, and take it all in! We then made our way down to Ammoudi port for lunch. There is a road to get down by card, but we made our way down by foot. It’s a beautiful walk down, but a good workout if you are walking back up!! We had lunch at Amoudi Fish Tavern. Sitting at a table right on the water, enjoying fresh octopus and greek salad. Perfect! Back in Fira for the sunset,… and for dinner! We had dinner at Salt & Pepper which was recommended by my bible (aka Guide Du Routard, a French travel guide book I take everywhere with me). Both the food and the staff were lovely. Make sure to book a table as it will get fuly booked very quickly! I spent a lot of time (I mean.. A LOT) researching which boat tour to do. There are so many different ones, and I highly recommend you book one in advance. Just like hotels, airport transfers and restaurants… Why not charge x5 the price, if tourists are happy to pay for it. I’m happy to contribute to a country’s economy, but like you I’m sure, I don’t like to get scammed ;-) So save yourself some time (and money) and book this tour. They have 6 different tours, we picked option 1 (which was the only tour running in low season) and it was perfect. The (beautiful, old Greek looking) boat, leaves the old port of Fira at 10:30am). Allow 20-30 minutes to walk down from Fira to the old port (*You can also get a cable car down, or ride a donkey… although bare in mind they only see the vet once a year! ).The boat tour we did lasted 6 hours. The boat will sail for about 15 minutes to the Hot Springs. You will have to jump off the boat and swim about 50m to the hot springs (where the water temperature is about 25 degrees C). The boat will then take you to the island of Thirassia, where you will have two hours to either walk up to the village, or have lunch in one of the fish taverns by the water. We had lunch at Labros restaurant (the fresh fish on the grill smelt too good not to stop). The boat then sails to Oia, where people can get off the enjoy the sunset (*You will have to make your own way back to Fira) and then back to the old port of Fira. Time to walk up those 500+ stairs back to the village (and slalom between the donkeys)! Definitely a good leg workout... but the view is beautiful! We had dinner in a restaurant called Stani, which I would higly recommend. I’m surprised it wasn’t in any of my guide books. Located in the center of Fira, it is a traditional greek tavern, where you can try any Greek speciality. The staff was absolutely lovely, and… you could even enjoy a beautiful view on the Caldera! Definetly check it out! On our last day, we decided to rent a quad bike and explore the South of the island. We drove from Fira to Pyrgos (about 3 miles), the highest village of Santorini. This super cute village is a lot less touristy, worth a visit! We then drove from Pyrgos to Kamari. The landscape is totally different from everywhere else on the island. Known as “black beach”, it is a nice place to sunbathe, or have lunch on the beach. …. Food on our mind. We made our way back to Fira for the last “gyros” of our trip! This traditional “take away” type food, is basically a large pitta, wrapped and filled with salad, grilled meat of your choice, tzaziki, and chips. Super cheap lunch (usually around €2.50) and even healthy if you skip the chips! Our ultimate favourite Gyros was from Lucky’s Souvlakis, in Fira. Our final stop (and probably the highlight of the trip!) was Firostefani. 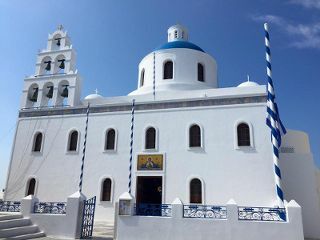 We drove up from Fira towards Oia and stopped by a big church in Firostefani. Then walked along the cliff for a good hour. The view from there is absolutely breathtaking. You just have to see it for yourself! For our last dinner, we booked a table at Ouzeri, which was recommended to us by a young couple on the boat. Our waiter Yorgos was the most welcoming, and the food was delicious! It was Easter Sunday, so we had traditional grilled lamb, as well as many other Greek delicacies. The perfect end to a perfect holiday! For a snack... Kalimera-Kalinixta (Fira) - Best smoothies & pastries! Ammoudi Fish Tavern (Oia) Also under "lunch"
Chloé Langer is a health, fitness & travel enthusiast from France, located in the UK.